It shows a support tickets waiting for a response. The customer ID of 0 indicates that it has been submitted through the client portal by a user without logging into the client area. If a user had logged into their account, and then submitted a ticket, their customer ID would show up in that field. A unique number identifying the customer. This field is editable only when adding a new account. This field is not editable. A unique number identifying the ticket. This field is not editable. The department the ticket belongs to. The edit mode for this field is a dropdown list. The subject of the ticket as entered by the customer. This field is not editable. The name of the customer who submitted the ticket. This field is not editable. The email address of the customer who submitted the ticket. This field is not editable. The date when the ticket was created. This field is not editable. The date when the ticket was last updated. This field is not editable. The urgency of the ticket. The edit mode for this field is a dropdown list. The status of the ticket. The edit mode for this field is a dropdown list. The bottom half of the window is where you can reply to the ticket. You can type your message into the box provided, check make this a private node if you would like to add a note to the ticket that the customer will not be able to view and select a new status for the ticket. 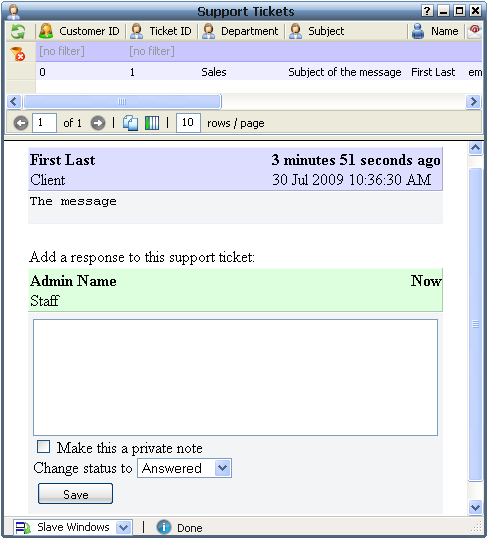 Then, click on the Save button to save the message to the server and send an email to the customer indicating their support ticket has been responded to.